There are many questions when we are pregnant and love exercising: Does exercise during pregnancy have any contraindications? For how long can exercise be performed? Which sports are good, and which are not? Women undergo hormonal changes during pregnancy. Some of them are intended to facilitate delivery. One of these changes is called ligamentous laxity which happens when the tension in a ligament is less than normal. Ligament laxity is needed to open the hips and facilitate delivery. On the other hand, it makes joints more unstable and sensitive to sudden movements and bouncing. Yoga and Pilates are great exercise choices for pregnant women. They represent a lower risk of getting hurt or having an accident. We all know contractions increase delivery. What we may not know is that contractions can also increase when you exercise. Do not worry! It happens because exercise increases your child’s heart rate. It is good both you and the baby. If you have persistent contractions, you must lower the exercise’s intensity. Having persistent contractions means 6 to 8 contractions occur within an hour. It means the most important thing is to control your exercise’s intensity. How to Calculate the Correct Exercise Intensity? It is not easy to define the correct exercise’s intensity for everyone. Every woman is a universe, one woman can be in great shape, while another may not. Experts recommend exercising for a total of 30 to 35 minutes. You can split the total time in 5 to 10 minutes of gentle warm-up and a stretch, followed by 20 to 25 minutes of exercise. It is beneficial to cool down and stretch when you are done. Practicing Yoga and/or Pilates for pregnant women is a great choice: they are low impact exercises you can practice on a soft mat placed on a comfy rug. There are other types of exercise during pregnancy, of course, all of them compatible with Yoga and Pilates, such as swimming, biking or walking. If you choose to swim, you will have to be aware of the hygienic measures you need to take as not sitting at the edge of the pool, drying well, and removing the bathing suit as soon as possible. If you choose to walk, you need to take the weather into account. It is harder to go for a walk during the winter, but you can plan this around the hottest time of the day. Yoga, on the other hand, can be performed all year long in the comfort of your house. Jogging itself could have a negative effect on the pelvic floor because of bouncing. Yoga or Pilates movements are more fluid. In addition, jogging shares the same disadvantages as walking. Biking could represent a greater risk for a pregnant woman than doing Yoga or Pilates. Extreme and contact sports such as skating, snowboarding, rock climbing, martial arts, football, or basketball (there are constant jumps), or diving involve risks that you do not need to take. Apart from these more obvious, there are others like tennis which performing fast movements that can destabilize you. Just consider the balance center of your body has changed because of the fetus and your new belly. Risk of abortion or previous miscarriage. Feelings of dizziness commonly happening. The baby develops a stronger heart. It reduces the risk of gestational diabetes and preeclampsia. It tones the muscles and makes you more flexible. You gain less weight while staying healthy for you and the baby. The baby is less likely to be premature. Each yoga practice is as unique as the yogi who steps on the mat. Yoga styles abound when you sign up for studio classes, search for at-home videos, or structure your own sequence that combines the best of several disciplines. Because each practice is one-of-a-kind, it’s also necessary to ensure that your outfit is well-suited to the specific style of yoga you intend to practice. What do you need to keep in mind so that your outfit can match your practice? Keep these four tips in mind to make sure that you’re dressed appropriately before you roll out your mat. Do you prefer the gentle styles of yoga nidra or are you more of a Bikram yoga fan? Knowing how much heat your class is intended to generate can help you to dress appropriately for the workout. Classes that are intended to work up a sweat need an outfit that can allow yogis to stay cool instead of overheating. Opt for black Capri leggings to keep cool, help wick away sweat, and allow you to move comfortably. A gentler practice may mean selecting a pair of ankle-length workout leggings or yoga pants to keep legs from feeling chilly. A light sweater may even be appropriate if the practice is mostly focused on stretching, meditation, and relaxation. If your sequence features a healthy amount of both heat-building poses and gentler stretching, consider adding light layers. This allows you to strip off some of the heavier sweaters or leg warmers during the most intense phases while keeping you comfortable during the finishing poses. Light layers are an easy addition to your yoga outfit that gives you the ability to change quickly during a brief pause in your practice. Sometimes yogis know in advance that they will spend a lot of time working on certain poses during their time on the mat. This especially applies to practice inversions which can be tricky to navigate without the right yoga attire. If you know that your practice will have a heavy emphasis on elevating your heart above your head, consider selecting high-waist Capri leggings to keep you covered as you move throughout the practice. Sure, the women’s workout leggings in the back of your closet may be adorable but do they fit you comfortably? Wearing yoga leggings that don’t allow your body to move swiftly through the poses without constant readjustment should be removed from your practice attire. Whether they’re too tight or too loose, fabric that doesn’t move with you as you flow through a vinyasa needs to be reconsidered. Clothing that is too tight can alter the breath, making for less efficient practice. Workout clothing that is too loose can cause unwanted bunching around joints, particularly the knees and shoulders. Some yogis may consider this simply an inconvenience. However, if the bunching is too severe, it can cause irritation throughout a lengthy practice. Yoga is a special form of meditation to give you the serenity that you need in this chaotic world. During yoga practice, you should be able to relax and meditate without absolute comfort. To do this, you will want to be dressed in the most comfortable clothes that would allow you to do those challenging stances and positions. Therefore, some basic advice will be given to assist you in purchasing your perfect yoga outfit. Comfort is the main concern that one should keep in mind when choosing clothes for yoga in yoga clothing. The clothes you wear should allow you to move every joint of your body freely without that fear of hindering blood flow. Loose clothing is a good choice, but it has the tendency to slide down when doing those bending positions. Thus, a good yoga outfit should provide easy motion and capability to allow parts of the body to move in different postures and positions. After all, yoga needs one to perform plenty of twisting and stretching; performing these steps in unfit yoga clothes could make the practitioner suffer. Elastic materials like spandex are better choice because they allow you to move freely without any part of the outfit getting in the way. Pure cotton is another material to consider, as it allows your skin to breathe in a proper manner and offers a lot of comfort. Wearing a sports bra that is comfortable enough for those moves is important as well. Look out for shoes with rubber soles and are as flat as possible for comfort. FootEase is a good brand of yoga footwear that relieves sore, cold, or aching feet. The unique shoes have herbs and rice inside that improve circulation in the feet. Yoga may seem like a gentle kind of exercise but keeping your body in challenging positions will surely make you break out into a sweat. Therefore, it is good to choose fabrics that are made of cotton which breathes and absorbs sweat. As doing different types of yoga produce heat, it can cause the body to sweat. One can start feeling moist and sticky if your yoga clothes are not sweat absorbent. So, it is recommended for people to buy yoga clothes that easily absorb sweat. One should select pure cotton as it keeps the human body cool and it easily absorbs sweat. Yoga is not just about moves, it is about how you see yourself in a positive way. Donning on clothes that make you look good is also a consideration. Choose stylish yoga outfits with color that suits your personality to make you feel good when doing the moves. It is vital that clothes to do yoga must be a perfect fit for your body figure. Take heed; it is not necessary that anyone wear a specific form of yoga clothes, the only thing that is important is how well the clothes fit. One should take some time for deciding which type of yoga clothes will fit the best. Shorts would also be good as it allows you to see your knees, feet, and ankles in proper alignment. Due to the numbers of yoga postures, in which your head moves lower than your hips that causes your top to slide down, it is important to choose a top that fits well and try the top out before attending yoga class to ensure that you will not be embarrassed. Tank tops are favorites that are made of materials that breathe and with designs that are trendy and appealing. Semi-fitted or spandex pants allow comfort while allowing full range of motion. Pants come in many different styles and designs. You can opt for anything from capri , to boot cut, to leggings, and more. Plus sizes are available for women who are voluptuous. Pants that look and fit well help the individual to feel their best during a workout. One should be practical while purchasing clothes for yoga. Never let clothes designer makes order one selections as the selections might not necessarily fit your body structure. Note that expensive yoga clothes do have a guarantee at all. One can purchase comfortable yoga clothes on a budget. If you are practicing yoga outdoors, it would be good to wear a snug-fitting hat that provides enough protection against the sun’s rays. A cap with a wide front brim and a tail at the back would protect your face and nape from harmful UV rays. It is very common that outfits alter their shape after washing them. If this happens with your yoga clothes, it can hinder exercise, as shapeless yoga outfits will get in the way while doing various yoga positions. Therefore, it is good to only buy clothes that are made from organic materials. Yoga is focused on giving you a healthy body and a peaceful mind. Dressing right, while doing yoga is necessary. If you practice yoga in ill-fitting and uncomfortable clothes, you might not be able to achieve the all that yoga has to offer. Take heed that yoga is supposed to make you calm despite your surroundings. Invest in the right yoga clothes to get the desired results of yoga. Have you ever thought about using crystals to deepen your yoga practice? If you’ve been to a lot of yoga classes before, you may have seen someone with a crystal or two placed at the front of their mat. The reason people do this is because crystals are believed to hold different healing and energizing properties. Each crystal holds a different frequency. Today we’re going to take a brief look at rose quartz, the healing benefits that it holds, and how you can incorporate it into your yoga practice. Rose quartz is a very common type of crystal. You’ve probably seen it before because it is very common in jewelry. It is a semi-clear crystal and looks just like normal quartz except it has a beautiful pink hue to it. Rose quartz is associated primarily with your heart. Most people associate pink with love and it is the same thing here. Wearing rose quartz or having it near you can help you open your heart a little more. You may want to use it to deepen your love for your significant other, your family, friends, work, or even yourself. A lot of the time, people forget about how important it is to love yourself. If you are one of those people, you might find it extremely helpful to use your rose quartz with yourself specifically in mind. It can create a beautiful and transformative connection for you. One of the most common ways that people use rose quartz is by wearing it. You can find many stores selling beautiful rose quartz necklaces, bracelets, earrings, and all other kinds of jewelry. Another common way that people use rose quartz is by placing a little piece of it at the front of their mat. You can place it on your mat or –if the class isn’t too busy– you might be able to place it in front of your mat so that you are free to move however you like without having to worry about laying on it. 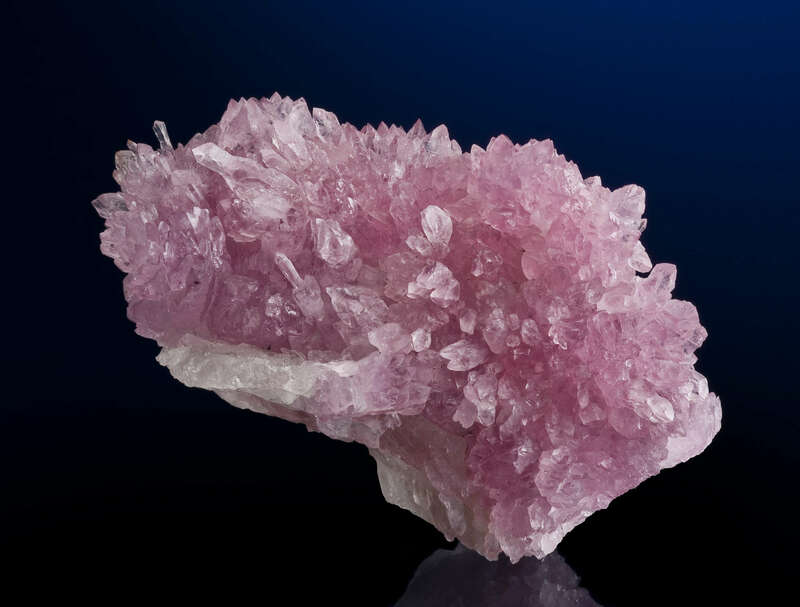 Another way to use rose quartz is by purchasing a large cluster of it. If you do have a large crystal or cluster of them, it is probably best if it is placed elsewhere in the room. It is not something that you can bring with you into class, but you might be surprised to find that your studio already has one. A lot of studios will already have things like amethyst and pink Himalayan salt lamps; it wouldn’t be a surprise if they have rose quartz as well. The yoga poses associated with rose quartz are every heart opener pose. These poses are any pose that creates a stretch or opening in your chest and front part of your body. Backbends are great heart openers, even if it is a very gentle one. Rose quartz may be just what you need in life right now to bring a little bit of extra love into your life. Whether it is self-love, love of others, or love of the things in your life, give rose quartz a try. When people say there is yoga out there for everyone, they aren’t lying. Yoga is flexible, which is why new and unique styles continue to be created. There are a lot of people that enjoy and stick to the traditional style of yoga, which is perfectly fine! However, for some people traditional yoga does not cut it. If you think traditional yoga is too slow-paced and drab, try to flair it up by trying Voga. Voga is by no means traditional yoga. Yes, you still do yoga poses but with a significant twist. Juliet Murrell fell in love with yoga but wanted to make it her own. She decided to create something that no one had thought of before. She combined her love for yoga and her love for voguing to create Voga. For those that were not around in the 80’s or those who don’t know a lot about that era, the term voguing may seem foreign to you. The term voguing comes from the 80’s dance craze that Madonna mentions in her song Vogue. Voguing is when you dance using model-like poses integrated with angular and rigid body movements. Basically, you are posing like a model over and over again, creating a type of dance. These dance poses are typically inspired by the models in Vogue magazine. Those who show up for Voga are usually decked out in 80’s throwback workout gear. Instead of yoga pants, people come to Voga wearing vintage swimsuits and leotards to get their work out on. How do you combine a calming exercise with a 1980’s dance? Surprisingly, Juliet Murrell combined the two totally different exercises perfectly. A Voga class consists of a yoga-style flow that incorporates Vogue-like poses. These poses are meant to be fun and energizing. Typically, classes end up feeling more like a night out on the town than a yoga class, but this could be because classes are usually held in bars and clubs. Traditional yoga classes are either held in silence or with soft music in the background in order to create a calming environment. This is the opposite of what the environment feels like during a Voga class. During class, 80’s music is constantly booming to create an uplifting, party atmosphere. The music also pushes those participating in the class further. Even though it’s fun, Voga is a pretty intense workout. Voga is not widely known, but it is gaining some followers. At the moment, Juliet Murrell only has one studio open called the “House of Voga” in London. However, Voga studios could very well start to pop up all over the place. Voga is bringing the 80’s back in a tremendous way. Posted on April 2, 2017 April 5, 2017 Author Elsa WexlerCategories YogaLeave a comment on Intense 10 Minute Total Body Workout!